Answering to users' request, we have come up with a new generation of hopup. Building from our successful FCC Advanced Hopup System Gen2, improvements have been added for consistency, and field adaptability, while keeping all the advantages of the FCC Pedigree such as the spring loaded hopup roller, double o-ring air seal & the identical CNC HOPUP housing etc. This systems system features a unique ring dial adjuster that stops at both end of the scale, Number markers on the ring allows the level of hopup applied to be seen, and memorise it for different BBs, different cylinders or even weather. Texturized dial makes it operable for last minute adjustment with gloves on. 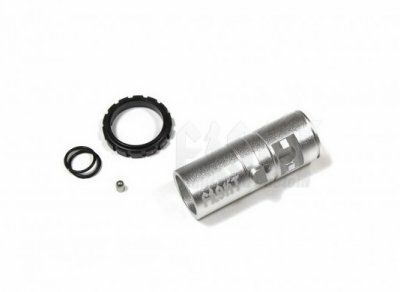 Improved barrel key has a threaded hole, using the supplied set screw, removing the barrel key is as easy as turning the set-screw in until the barrel key comes out, allowing convenient maintenance with minimal number of tools. Transforming your FCC Gen1/Gen2/SYS hopup only takes minutes (subjected to skill level of course). **Note**This kit includes parts nessessary to transform your FCC Advance and Sys hopup into a dial adjusted version. Package comes with three identical o-rings, it is essential that one of the o-rings to be used in the groove that is in contact with the ring dial, install the o-ring AFTER the ring dial is in place. The o-ring placed towards the end of the chamber is optional and spare.